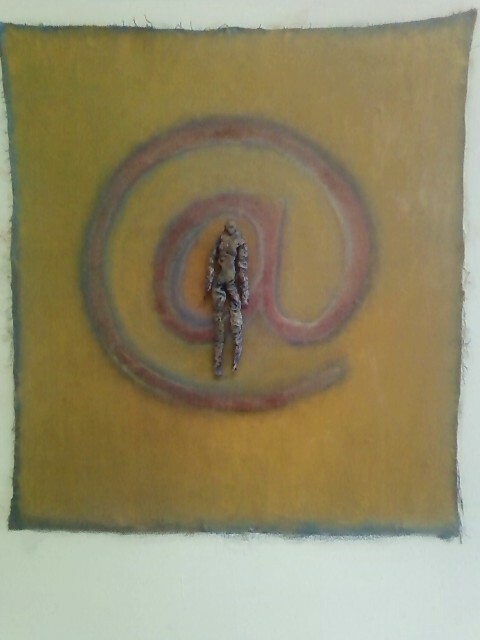 The "Modern ' @ ' Collection, the alphaspiral", conceived by Pedro Romero Sedeno in August 2010, is his series of artworks investigating the symbol "@", so as to inform his works done in the plastic arts (painting and sculpture). Referring to the Norwegian name for the symbol "alphakroll" or "alphacurl", Romero sees the symbol graphically as the letter "a" to which is attached a budding spiral. The spiral is one of the four basic elements of Western symbolmaking, according to The Dictionary of Symbols, by Carl Liungman and symbolizes movement and potential energy. 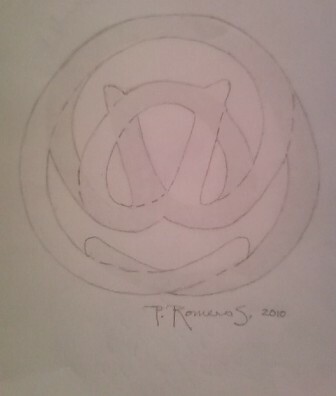 Thus, Romero names the symbol '@' as the "alphaspiral". Romero's philosophy is that the @ symbol has served positive functions for centuries; in ours, to enable communications and, often, to empower and enrich people's lives. As an artist relating to this ever-modern graphic symbol, he assigns a new function to the symbol, i.e .to inform and empower his art. This series is a creative reply to the Museum of Modern Art (MOMA) in Manhattan and its statement about the ubiquitous symbol, the @, my alphaspiral. In March of 2010, MOMA's curator of design and architecture, Paola Antonelli, announced that the Museum's curatorial process had acquired the symbol @ for its collection. For context, clik here for a video. 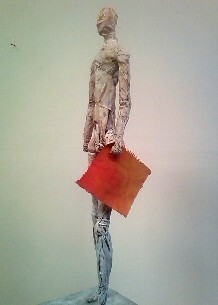 Antonelli was quoted in ARTnews Magazine that the acquisition was "emblematic of .... tradition updated for modernity". This statement resonated with thought behind Romero's work in canvas 3-dimensionally (see Portfolio), in which the tradition of oil-on-canvas is updated for modernity. 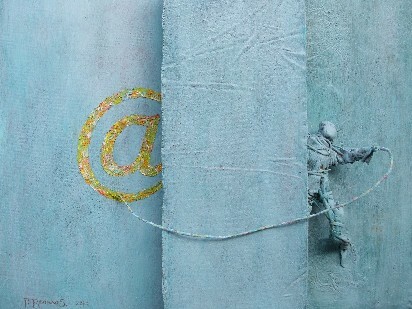 This sculptural work is now being informed by his dialogue with the alphaspiral , the @ symbol . 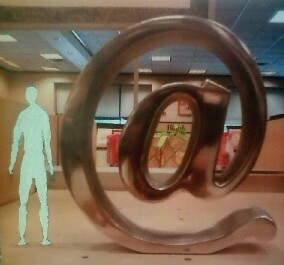 This image on my homepage is a visualization of a monumental "@" alphaspiral, 8 ft high, which could be fabricated in bronze or stainless steel. Please contact for a detailed proposal. "The Modern ' @ ' Collection ". It suggests to me an insect's head with a large eye, or baby bird's head when first born. 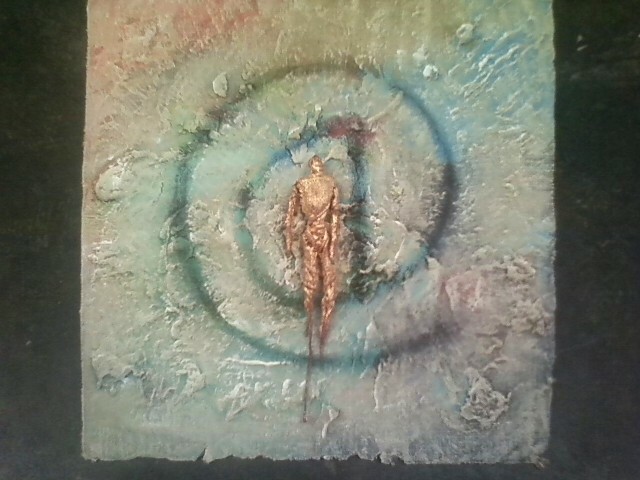 One of my first creative encounters with the alphaspiral resulted in this new motif. 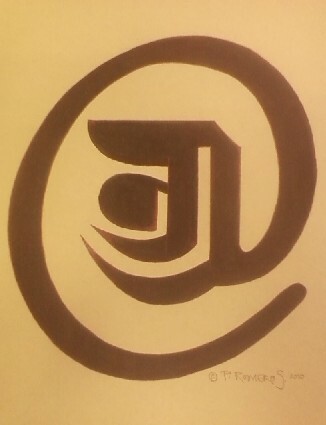 By simply rotating the @ clockwise 100 degrees, the symbol reads as a new glyph. A search of images on the Internet for "@" will result in an ad infinitum number of design applications which essentially replicate the @. My main interest, on a design level, is to see how the symbol can be deconstructed and/or upstepped, to morph and evolve into new glyphs and functions. 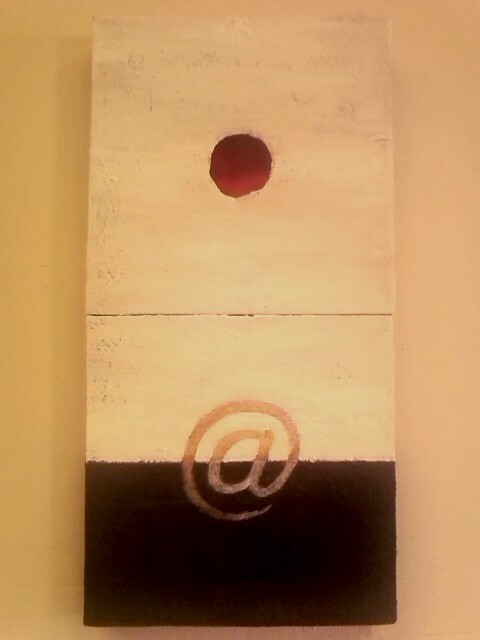 In my painting and sculptural work, I allow the @ to function as a modern ideograph, a mark of my place in time in the Internet age. From this place, I can envision and articulate what I call "Supermodern art". 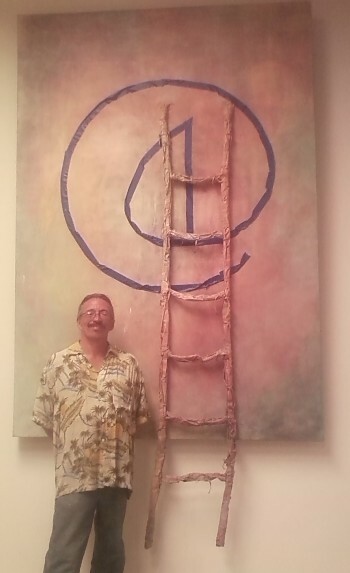 "Homage to Ray Tomlinson" , oil on line and wire, 48" x 84" x 10"
Raymond Tomlinson is the American programmer who sent the first email in 1971, using the symbol @ to indicate the recipient's location. 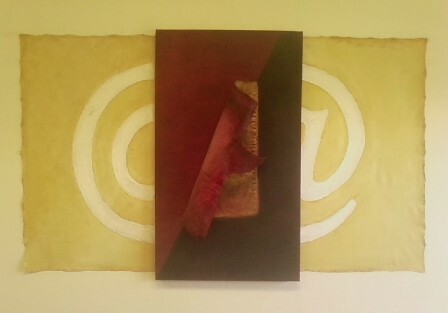 This wallpiece in relief integrates one of my first investigations using canvas for sculpture. 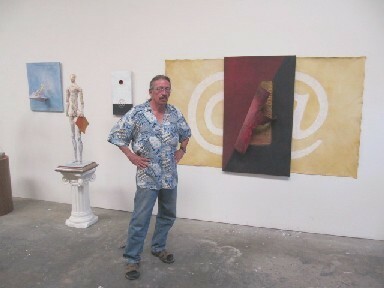 "Diptych: 'At'las #1", oil on canvas on canvas, 20" x 10" x 2", P. Romero S. 2010. The red dot in the top panel is actually a hole cut in a top-layer of canvas, the red painted on an underlying layer of canvas. Using the 'a' of the Sanskrit alphabet (Lanza script), a new/ancient @ is formed. Sanskrit is one of the world's oldest languages. 1448 In one reputed early use, the @ symbol appears before a wheat shipment from Castille to Aragon. 1885 The first typewriter includes the still-obscure sign, mainly used by accountants to denote cost per item. 1971 The first email, sent by American programmer Raymond Tomlinson, uses the symbol to indicate the recipient's location. 2010 With an estimated 210bn emails sent per day and many other uses besides, the @ sign is one of the most ubiquitous pieces of punctuation in the world. 2010 The Museum of Modern Art, NY, department of architecture and design, acquires the @ symbol for its collection.